It seems an age since I first heard Shearwater on an NPR podcast (what would I do without NPR and the other US public service stations – where’s the UK equivalent?) and tried to get hold of Rook, their second album. There was something immediately affecting about their music, an odd combination of fragility and strength. Golden Archipelago, their third offering, must be one of the albums of this year – graceful, undeniably beautiful, full of regret and anger. The fact that they decided to cruise by a strange little social club in leafy, suburban Bristol was too good to be true and so Mrs HC and I rocked up super early (my fault, I must have a good spot!) in the golden, warm evening sun. A strange, tiny (what maybe 150 people when its maxed out? ), venue with a stage area whose size, according to Jonathon Meiburg’s quoting of his his tour notes is ‘variable , adequate’ – “you know you’re in England when you see notes like that” he joshed. Support was courtesy of a Nils Frahm, a Berliner playing unaccompanied piano pieces. Seemed like a nice young chap even if his soft German accent couldn’t help bring to mind @stephenfry and his imitation of a German gay… The pieces were mesmerising, played with such fluency and heart. Reminiscent at times of Philip Glass structures but with emotional chord progressions and a cinematic quality. Not easy to deliver music like this in such a personal, close proximity environment, but he had me from early in the first piece. CD duly bought. The Shearwater chaps (and lady-chap) wandered around the instruments and micro-stage, tuning, re-positioning and then with no to-do they were off. The albums give me goose bumps and I have to admit given the right place and mental state, bring a tear to my eye. Of course some of the finesse of the recordings cannot be reproduced live but the class of playing is there, the band members awareness of each other, and the sheer quality of the songs all more than make up for any minor technical losses. The set was a sensible and rewarding mix of stuff from all three albums, the latest of course getting due prominence. The first four of five songs were played through back to back and I wondered if we would get no interaction form the band, but then a bit of banter broke out and the personal connection was made. 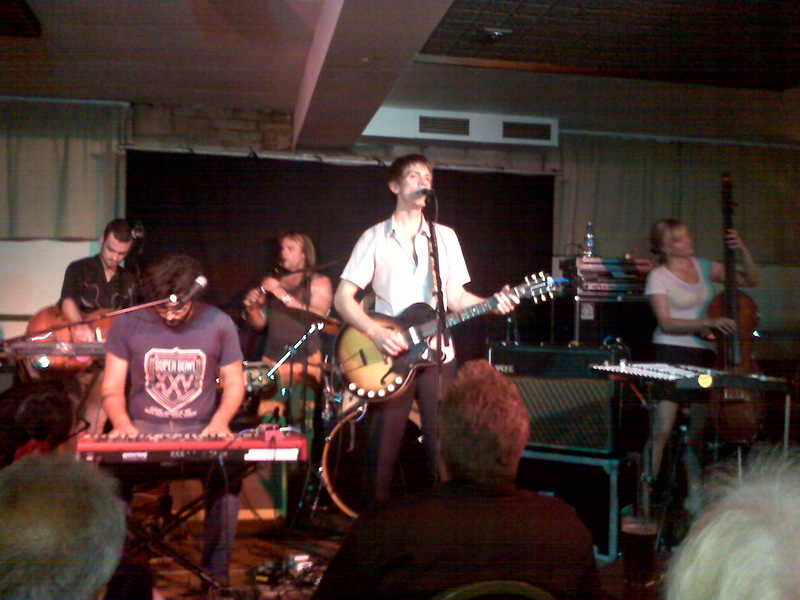 As so often live , material comes over in a more muscular way so the contrast between songs like Corridors for which we were asked to ‘hold onto our hats’ and the delicate and heart rending songs like Hidden Lakes and Missing Islands was even more marked; a credit to their ability to let go when needed but other times play with control and constraint. I, and I am sure everyone else there, could have listened all night, captivated by Jonathon Meiburg’s vocal delivery and the bands multi-instrumental talents. Called back of course for the encore they finally left after delivering the majestic Snow Leopard. Quite sublime. Of course a stop by the merch stand was required and the purchase of Herr Frahm’s cd and a suitably elephantine sized Shearwater T was made. The super-cool thing about gigs of this size is you get a real chance to meet the band and so I was genuinely thrilled (what a girlie groupie I am) to shake the hand of Jonathon Meiburg and have a (frankly fawning and gloopy) chat with him. But it is brilliant to be able to tell someone face to face just how much you value their music. What a lovely chap too – and he promises to come back to Brizzle as well. 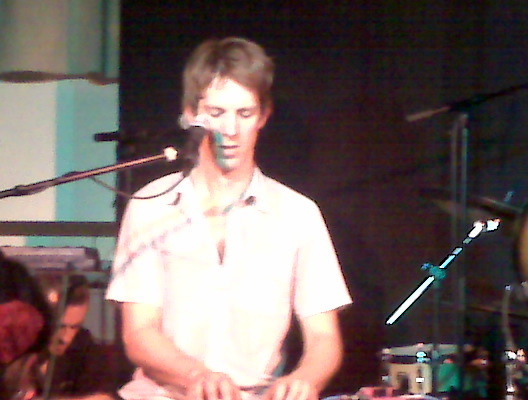 This entry was posted in Uncategorized and tagged Gig, Shearwater. Bookmark the permalink.